Should i use the Glyph of Icy Veins only after get a haste cap or use it anyway? Use it or don't use will provide the same effect? Another question, when FoF and Brain Freeze procs, the damage will be affected by mastery too? Regarding the Glyph of Us, the tooltip is wrong on both WowDB and Wowhead. Each bolt deals 40% of the normal spell damage. Since you have 3 bolts, you will deal 120% of the initial damage, or +20%. This does not translate as a direct +20% damage increase (as is the case for using Icy Veins without the glyph). Glyph of Icy Veins only affects some of your spells (it does not affect Frozen Orb, for example), so overall, you will gain less than 20% damage by using the glyph. So, you should only use it if Icy Veins is causing you to hit the global cooldown. When Fingers of Frost and Brain Freeze proc, the damage of Ice Lance and Frostfire Bolt, respectively, will be increased by your Mastery. To convince yourself, look at what the tooltips of these spells say when you have a proc and when you do not. But, what do u mean with "So, you should only use it if Icy Veins is causing you to hit the global cooldown." ? What is hit the global cooldown? When you cast a spell, there is a delay before you can cast another spell. For example, cast Frostbolt and look at the icon for Ice Lance, you will see that it is going to become greyed for a bit. This delay is the global cooldown and it prevents you from spamming instant cast spells. The default value of this delay (or global cooldown) is 1.5 second. You can decrease this value by increasing your haste. There is a limit though; you cannot decrease the global cooldown further than 1 second. You hit the global cooldown on a spell when you cast it in less than 1 second. The wording of the expression is meant to reflect the fact that a part of your haste is wasted (even if you cast in less than 1 second, you still have to wait for a full second before being able to cast again). For Frost Mages, this is a situation that can often arise for Frostbolt when you are using both Time Warp and Icy Veins at the same time. 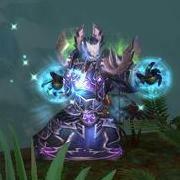 In a raid environment, you only need 22% haste for Frostbolt to be cast in less than 1 second when Time Warp and Icy Veins are active. My haste (w/Frost Armor) is at 20.03 and with Icy Veins increases to 44.03. Include Time Warp and it's up to 56.03 and brings Frostbolt down to 1.07 from a base of 1.69 so I'm a little confused about the 22% number. I'm assuming for the time being until I get more haste and start to fall below one second cast time I'm fine without Icy Veins glyph, but I was wondering if you could help me understand what I think I'm confused about. Sorry for the delay, it's a bit of a crazy period. Imagine you have 22% haste. The Haste raid buff gives you +5%, Icy Veins +20%, and Time Warp +30%. Haste is multiplicative, which means that if you have 22% and you increase it by 5%, you get 28.1% (1.22*1.05) and not 27%. If you increase again by 20% and 30%, you obtain 100% haste (1.22*1.05*1.2*1.3). Frostbolt has a base cast time of 2 seconds, so with 100% haste you cast it in 1 second, hence the 22% value (i.e., the value at which you will start casting Frostbolt in less than 1 second with Icy Veins and Time Warp enabled). Ah! I see! So it is once we hit 22% that the buffs will carry us to a 100% haste rating, and anything above 22% offers diminishing returns (GCD up time). Thanks a bunch for that clarification. Since you have 3 bolts, you will deal 120% of the initial damage, or +20%. This does not translate as a direct +20% damage increase (as is the case for using Icy Veins without the glyph). so with 100% haste you cast it in 1 second, hence the 22% value (i.e., the value at which you will start casting Frostbolt in less than 1 second with Icy Veins and Time Warp enabled). You answers are very detailed and helpful. Thank you. But I'd like to point out an issue. I think your focus is on the wrong spells. Even though haste effects stack multiplicatively, an un-glyphed Icy Veins is only a 20% boost for Frostbolt, mage bomb (Living Bomb, Nether Tempest, or Frost Bomb), and Frozen Orb. In the real world it is not hard to get 20%+ base haste in a raid scenario. This means an un-glyphed Icy Veins will do nothing for insta-cast spells during Heroism. (The GCD cap is 50% haste.) Effectively making it not a flat 20% buff. I can understand how an un-glyphed Icy Veins would function very well outside of Heroism. However, Heroism is when many cooldowns are stacked. Frozen Orb and Alter Time make it very easy to have lots of FoF and BF procs during this time. I averaged around 60% of my Heroism time casting instant-spells when simming on the PTR this past week. If you are going to use Icy Veins during Heroism, it is much better to have it glyphed. I can understand how an un-glyphed Icy Veins would function very well outside of Heroism. However, Heroism is when many cooldowns are stacked. Frozen Orb and Alter Time make it very easy to have lots of FoF and BF procs during this time. I averaged around 60% of my Heroism time casting instant-spells when simming on the PTR this passed week. If you are going to use Icy Veins during Heroism, it is much better to have it glyphed. I wanted to clarify the specifics behind the Icy Veins glyph during Heroism. This was meant as a reference for the original question. I wasn't challenging your excellent explanation of the Frostbolt cap. Sorry if that sounded like I was trying to one-up you. That was not the intention.